This mod is still in Beta stage and is subject to constant changes and balancing with vanilla Stellaris content! There may be bugs and typos. 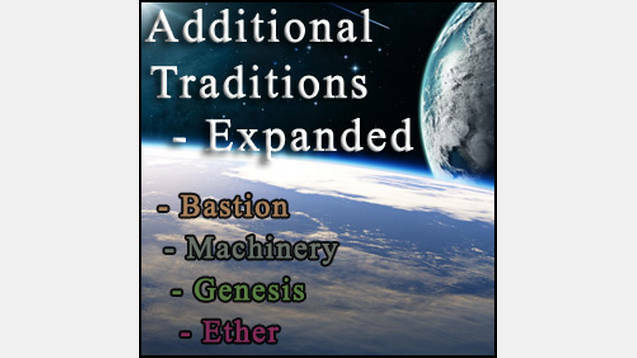 This expansion together with original mod is based on Birdy‘s Plentiful Traditions template and was heavily inspired by Maethydd‘s Expanded Tradition Choice. So a big thanks to them, and feel free to check their mods if you don’t agree with this vision on traditions! Thanks to greenpinkredfire for big help in making full Russian localization! Thanks to Geki for uniting this mod with other tradition mods in Merged Traditions! It should be compatible with any other mod that do not touch that file.